1000's of California's Migrating to the Las Vegas Valley With The Top 3 Reasons Being Lower Cost of Living, Low Property Taxes and No Personal State Income Tax in Nevada. According to the Census Bureau data, California has lost over 138,000 people in 12 months from July 2016 to July 2017. The huge decrease of population is continuing throughout 2018, with a large number of people leaving the state of California due to extremely high costs of living. As stated on CNBC, Californians are pressured by high housing costs and additional fees including taxes, gas prices, food and other expenses. With too much on their plate, low-income families from the state of California, as well as some of the middle class families, are looking for ways out of the country. California has lost the majority of its population to no other than domestic migration, as its former residents were seeking for other states within America that are more suitable for living on a budget. While a good amount of residents spread all over the country, the majority of those looking for an escape from California found their new home in the state of Nevada. To be more percise, the city of Las Vegas in Nevada has been the most popular location for Californians to move with over 100,000+ migrating in the last 10 years. Ashley McCormick, a local Las Vegas real estate agent with Urban Nest Realty, say “We have entire master planned communites like Southern Highlands being bought out mostly by Californias”. She notes that the location of this community is the first to be seen as weekend communters from California arrive by car and see the prices. McCormick also adds that they like being able to access the highway to go back to visit friends and family in California. McCormick says “They see full size homes starting at $290,000 and inquire in disbelief as a similar home in California can be double or triple the price.” Southern Highlands has recently sold multi million dollar homes to incoming NFL Raiders team members and opened a new mega pubilc park. According to the Las Vegas Chamber of Commerce, 30% of home buyers in Las Vegas are from California to include the California NFL team that will start 2020 as the Las Vegas Raiders. William Margita, an industry real estate leader in Las Vegas, says most Californias are cutting their bills in half by moving to Las Vegas. He mentions sites that compare ‘cost of living’ like Numbeo.com show San Fransico, Palo Alto and Los Angeles to be the largest difference in cost and lifestyle. Furthermore, it is important to mention that the rent prices in California go way beyond the national average, with the average rent price for a two-bedroom apartment being $2739, as confirmed by rentcafe.com. On the other hand, renting the same size apartment in Las Vegas would cost way less at the price of $1297. Looking past the Las Vegas property tax, Las Vegas features lower costs of living in general, with its gas prices being 0.50$ cheaper than that of Los Angeles, California. Another major reason why Californians are moving to Las Vegas, Nevada, in big numbers is the tax situation in the state. Once again, SmartAsset has confirmed that Las Vegas offers better living conditions, considering the fact that it has no income tax. On the other hand, California has the highest income tax percentage in all of America, equalling to 13.3%. While California truly is a beautiful place to live in, with stunning beaches and warm weather all year round, some of its residents can no longer deal with the insanely high rent fees and additional expenses. The cost of living in California is much larger than that of Las Vegas, in every possible aspect that could be compared. For example, Las Vegas offers lower housing costs, as well as lower gas prices and general living expenses. Since the Californian real estate market is blowing up with extremely high property prices, housing seems to be the number one reason why the majority of the population are packing their bags and heading to Las Vegas. Besides the Californian properties being listed as highly expensive, the high demand causes for crowded bidding wars on almost every property. The competitive bidding wars are another cause of insanely high property prices in the state. If we were to compare the states of California and Nevada, the same amount of money that would get a resident a single-family home in California would get them a luxurious mansion in Nevada. On top of the high property prices, low housing availability is another common issue in California that is preventing low and middle class families from moving to or staying in the state. According to the USC Dornsife/Los Angeles Times Poll, conducted in November 2017, the chief reason why California is losing residents to other states at a rate faster than ever are the generally high costs of living within the state. A total of 1504 Californians who participated in the poll agreed that the high costs of living combined with high rent prices and taxes were the reasons they were looking to move out of California’s boarders. Christopher Bishop, the president of the Greater Las Vegas Association of Realtors, did a great job of putting the situation into words. As he explained, even people who work for several Sillicon Valley companies choose to do their work remotely from their home in Las Vegas in order to avoid the ridiculously high expenses of living in California. As confirmed on SmartAsset.com, there is a huge difference between the housing prices in California and Nevada. Areas of the state such as the Santa Clara County have a median home sale price of $641,000 while in Las Vegas the median home sale price is $290,000. With that said, it is clear to see why thousands of Californias are leaving the state and heading to Las Vegas. Besides individuals and families looking to start a new life in the state of Nevada, many tech companies and start ups have moved over to Las Vegas just because of the tax benefits. 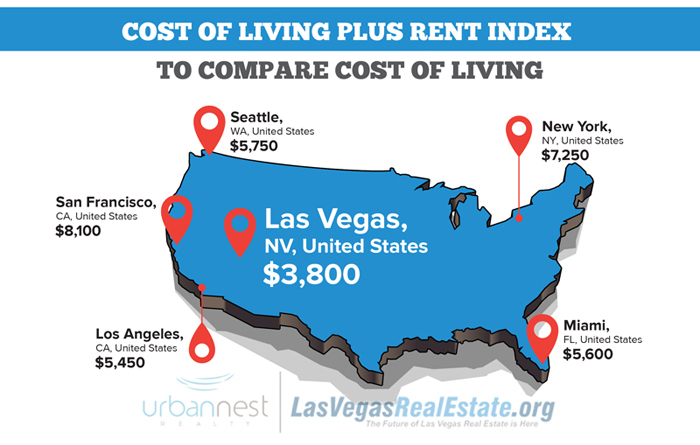 The cost of living in Las Vegas is also relatively low, with a significant difference compared to that of California. With that said, the state of Nevada and more specifically the city of Las Vegas have seen an enormous boost in population over the last couple of years, with the majority of new residents being the former residents of California. Even though the housing market in Las Vegas is becoming more competitive with the large numbers of people moving to the city, the property costs are still significantly lower compared to those in California. Besides, thanks to consistent development and growth, Las Vegas has become a global village that has a lot more to offer than tourism and gambling.